We are honored to be featured in Cottage Hill, one of our favorite publications! You can see the feature here. "A group of Maui, Hawaii friends (and creatives) gathered to compose a table scene featuring an afternoon cake with local upcountry persimmons and coffee. The recipe was lifted from the pages of Julia Turshen's cookbook Small Victories: Recipes, Advice + Hundreds of Ideas for Home Cooking Triumphs. 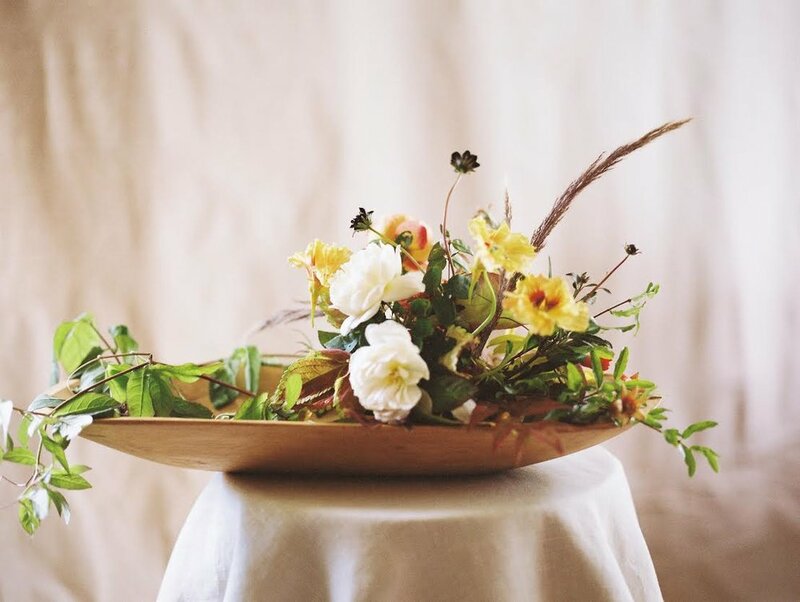 Floral designer Mandy Grace foraged all of the locally-grown blooms from a friend's garden and surrounding nature in Upcountry Kula at 4,000 FT elevation including nasturtium, Distant Drum garden rose, Iceberg by David Austin, nandina foliage, pomegranate, foliage, coleus, chocolate cosmos were thoughtfully placed in a wooden dough bowl. When you think of flowers intrinsic to Hawaii, vibrant pops of color and tropical blooms come to mind. We wanted to show a softer side of the island's diverse natural offerings and were inspired by an earthy color story. Persimmons happened to be in season and added a cool pop of color to the scene. 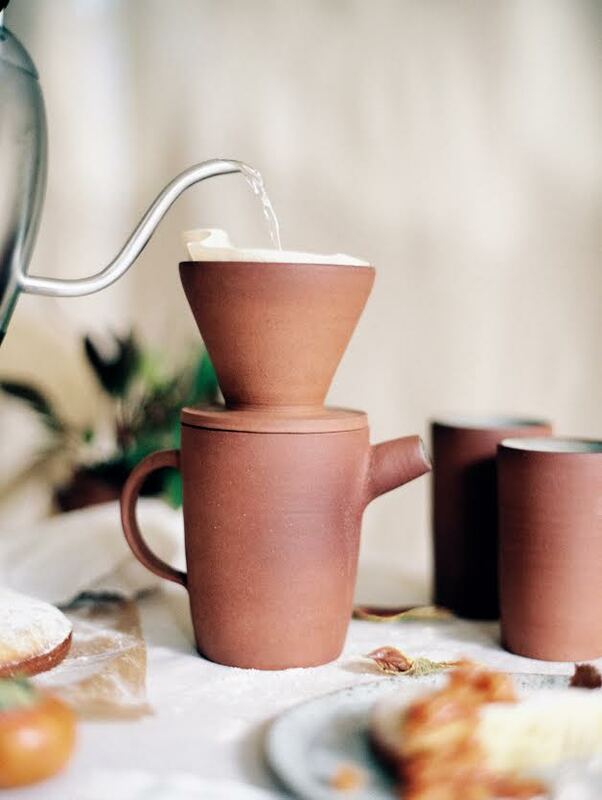 Hawaii ceramic artist Meghan of Seeds + Stone makes gorgeous plates and bowls and coffee mugs. We visited her workshop in the jungles of Haiku to source a mash-up of dinnerware. Her coffee pitcher with matching pour-over is a beautiful shade of rust. As fans of Design*Sponge, we came across Julia Turshen's cookbook Small Victories: Recipes, Advice + Hundreds of Ideas for Home Cooking Triumphs. The Afternoon cake was simple and delicious!" Preheat your oven to 350°F [180°C]. Use your hands to butter the bottom and sides of an 8-in [20-cm] cake pan, then line the bottom with a circle of parchment paper. For good measure, butter the parchment paper. Set the pan aside. In a medium bowl, whisk together the flour, ground nuts, baking powder, and salt. In a large bowl, whisk the eggs until the whites and yolks are fully combined. Add the olive oil and granulated sugar and whisk until the sugar is dissolved (test by rubbing some of the mixtures between two fingers). Whisk in the vanilla, orange zest, and orange juice. Whisk in the flour mixture. Pour the batter into the prepared pan, being sure to use a rubber spatula to get it all out of the bowl. Hold the pan just a little bit above the counter and then drop it on the counter to eliminate any air bubbles. Bake until the cake is beautifully golden brown and a toothpick inserted in the center comes out clean, 25 to 30 minutes. Transfer the cake, still in its pan, to a wire rack and let it cool completely. Once cool, use a dinner knife to loosen the edges of the cake from the pan and invert it onto your work surface (you might need to give the pan a little whack). Peel off and discard the parchment. Invert the cake one more time onto a serving platter so the flat side is down and the domed side is up. Just before serving, dust the cake with powdered sugar. Note: Any nut works well in this cake. To make ground nuts, just put whichever type of nut you’d like (I’ve made this cake successfully with walnuts, almonds, hazelnuts, and pistachios, and am sure pecans and pine nuts would also be great) in the food processor and blitz until they’re as fine as cornmeal. Or use a mortar and pestle. Or purchase ground nuts, which often go by the name “meal” or “flour” as in “almond meal” or “almond flour.” For a nut-free cake, simply omit the ground nuts and add an additional ½ cup [60 g] flour. Feel free to substitute any citrus in place of the orange. Clementine, tangerine, blood orange, and grapefruit zest all work very well. For a lemon-poppy seed cake, use lemon zest and juice instead of orange and add 1 Tbsp poppy seeds to the batter. If you’re using ground almonds, add 1/2 tsp almond extract to the batter for a more intense almond flavor. Just before you put the cake in the oven, dot the top with 1/4 cup [80 g] raspberry jam and use a fork or the tip of a paring knife to swirl in the jam. *From Small Victories by Julia Turshen, photographs by Gentl + Hyers (Chronicle Books, 2016). I'm calling this shoot a beautiful mistake because it all began with a classic case of miscommunication. My team was on the cusp of "wedding season" here in Hawaii and I shot off a stream of emails to my floral wholesaler with a bunch orders and dates. In a lengthy back and forth email thread, one of my floral orders was scheduled and set to arrive one week earlier than expected (better than later!). I couldn't possibly let all of these gorgeous blooms go to waste so I asked friends in the industry if they had a use for them but it was so last minute that they did not. So I called upon my friends to collaborate on a quick shoot in my workshop. The best shoots come together organically, I swear! The images below are some of my favorite work to date, captured by the ever-awesome Trish Barker. The Find Lab processed her rolls of film and I couldn't be happier with the results. Our storyline came together with ease. We set out to capture a few of our favorite things about the summer season: bright, colorful floral arrangements and cocktails to match for a simple gathering. We paired four summer floral arrangements with signature cocktails by Garnish Craft Cocktail Catering. You can find the cocktail recipes featured on Wedding Sparrow, one of my favorite fine art wedding sites. Enjoy! One of the first wedding design workshops I attended outside of my home state of Hawaii was Pearl & Godiva's Beauteous workshop all the way in Ireland. Although I was immediately drawn to the ethereal, grainy quality of film photography, the styling pilgrimage really opened my eyes to the slow intention of the craft thanks to the workshop's principal photographer Erich McVey. That was already two years ago now (wow, time is an elusive thing), and since then I've been making a deliberate effort to master the modern day work-life-balance. Part of my intention in 2017 has been to carve out some time for myself and my creative development as a business owner and floral designer, which brings me to my most recent journey to Mexico City to attend Sarah Winward + Soil and Stem's workshop. It was a great distance to travel (30+ hours of flight time from Maui to be exact). But man, was it worth it. I can still feel the vibrant, colorful beat of Mexico pulsing through my veins. At the last minute, Sarah and Nicole had to switch up the location of the workshop to an insanely gorgeous property two hours outside of Mexico City. Hacienda Acamilpa, a 17th century timeworn sugar mill was one of the more spectacular spots I've visited. It was kind of surreal to find myself at yet another rustic and beautiful sugar mill as I often work inside of the ancient ruins of the Haiku Mill on Maui. The workshop agenda was to learn their compositional approach to lush hand-tied bouquets, large floral installation design and working with natural growth to create texture and movement. For me, attending these workshops isn't so much about the actual craft but about the relationships you naturally form with like-minded designers from all over the world. You kind of have to get outside of your comfort zone, travel alone, immerse yourself in a foreign culture and go for it. I'm eternally grateful for the time spent with once-strangers who have become my friends in the beautiful world of flowers, vines and branches. Till next time, Mexico!